Dr. Dan Givens, left, associate dean for Academic Affairs, is shown with Dr. Misty Edmondson, center, an associate professor of farm animal medicine in the Department of Clinical Sciences, and Glen Sellers, a clinical lecturer teaching business practice management to veterinary students. The team has been instrumental in obtaining a $237,233 USDA-NIFA grant that will enhance veterinary services to underserved rural populations in Kentucky. 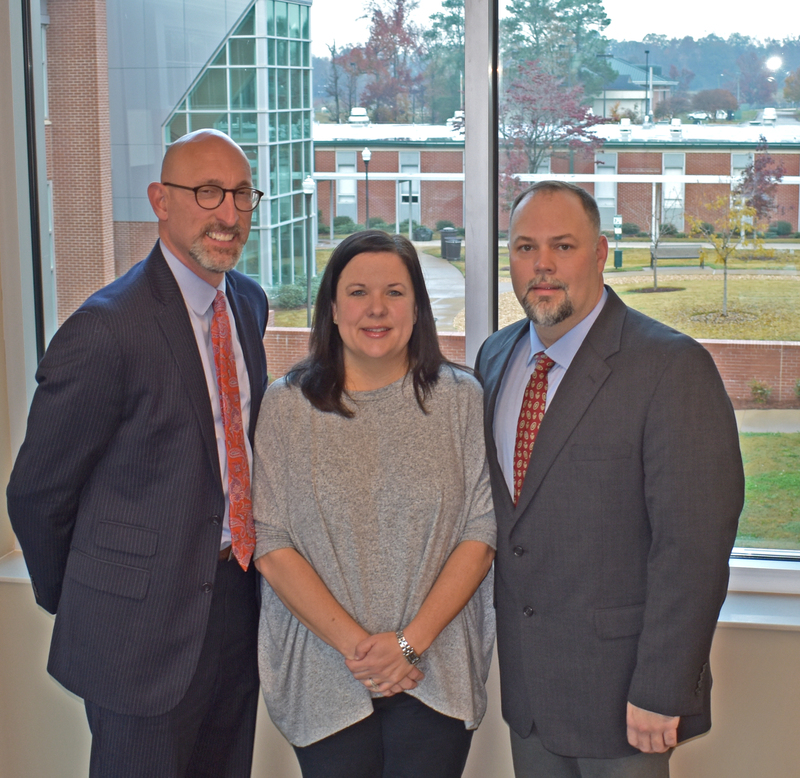 The Auburn University College of Veterinary Medicine is directing a program to strengthen veterinary services to designated underserved rural populations in Kentucky through a grant provided by the USDA’s Veterinary Services Grant Program and in partnership with Kentucky veterinarians. The $237,233 grant allows the college to create a program to “develop, implement and sustain private veterinary services through education, training, recruitment, placement and retention of veterinarians and students of veterinary medicine,” said Dr. Dan Givens, associate dean for Academic Affairs at the College of Veterinary Medicine. It is one of 13 grants by the U.S. Department of Agriculture’s National Institute of Food and Agriculture, or USDA-NIFA. – Facilitate and create networking opportunities that assist graduating veterinarians in transitioning into sustainable careers in rural underserved areas. Leading the project are Dr. Misty Edmondson, an associate professor of farm animal medicine in the Department of Clinical Sciences, and Glen Sellers, a clinical lecturer teaching business practice management to veterinary students. “Their expertise will enhance student and practitioner recruitment and provide mentoring and career enhancement,” Givens said. The grant allows programs already in existence at the College of Veterinary Medicine—the college’s practice management rotation and preceptorship program—the opportunity for greater impact. The grant will match senior veterinary students interested in large animal veterinary medicine with rural Kentucky veterinarians where additional veterinarian help is needed. Veterinarians will mentor senior veterinary students and can have their practice participate in the business practice management program. This program further solidifies an agreement between the Commonwealth of Kentucky and Auburn’s College of Veterinary Medicine, which began more than 65 years ago, essentially Auburn being Kentucky’s veterinary medical program. Since 1951, Auburn has enrolled Kentucky students through a program managed by the Southern Regional Education Board, or SREB, by which a set number of seats in each incoming class at the college is reserved for Kentucky students, and guarantees that Auburn charges Kentucky students in-state rates, with the commonwealth providing Auburn the tuition difference. More than 1,900 contract spaces have been made available and filled with Kentucky students; currently 38 seats in each 120-member veterinary class are Kentucky students who pay resident tuition and fees. – a 50-mile radius around Columbia in Adair County. The areas identified are based on high cattle-to-veterinarian ratios, demographics indicating that many of the current food animal veterinarians are older and have limited their practice, or are retired, and the number of practices which have a significant food animal focus but only one veterinarian, despite recruitment attempts. For more than 40 years, Auburn’s preceptorship program has been a capstone educational experience for veterinary students. The eight-week training experience at the end of fourth-year students’ academic career provides clinical practice experience under the supervision of a practicing veterinarian. “Sustainability of the practice hinges on getting students in a practical setting, understanding life in a rural area, and that is where preceptorships and externships are important,” said Edmondson. Another key component, and highly sought-after by students and veterinarians, is the Veterinary Practice Management rotation, which exposes students to business practices, disciplines and strategies including accounting, economics, finance, hospital design, marketing, management, negotiations, human resources or labor relations, law and taxation. The business practice management rotation, taught as an elective course to veterinary students, has evolved to provide students practical business management knowledge as well as assist the practicing veterinarian through students taking an in-depth look at the business side of veterinary medicine. “Students, under the supervision of faculty, complete an in-depth analysis of the veterinary practice, write an extensive report, meet with the practice owner to discuss their evaluation findings and present their ideas,” Sellers said. “The recommendations in the comprehensive report are specific to each practice and, we believe, provide the practice owner ideas that help increase work efficiency and overall profits.